Fulfilling president Putin’s call for increased inter-regional, Moscow-avoiding domestic air travel options for Russian citizens, and in a move much followed and feared by local competitors, state-controlled Aeroflot has launched the development of new additional regional hubs by signing an agreement to set up the Group’s second international and regional hub at Krasnoyarsk, Siberia. A three-way agreement between Aeroflot, the government of the Krasnoyarsk region and Krasnoyarsk’s upgraded Yemelyanovo airport (KJA) was signed on March 29 and, although Aeroflot has released few details about the programme, this second hub, which is scheduled to open in 2020, has a challenging plan that projects up to one million additional passengers served there by the group annually by 2023. The announcement does point out that the hub’s business model guarantees convenient connections, “that will enable us to attract transit passengers both on domestic and international routes. We are also planning to create a number of other regional bases in Russia. Aeroflot Group will make a significant contribution to fulfilling the president’s directive aimed at expanding the route network [options] of inter-regional regular flights avoiding Moscow,” states Andrey Panov, Aeroflot’s deputy chief executive of strategy and marketing. Krasnoyarsk is the third-largest city in Siberia, with a population of some one million, and has been chosen because of its geographical location which particularly favours the generation of additional transit traffic flows from Asia to Europe, with China its most dynamic growth region. Also, the airport has recently been renovated. “A year and a half ago, we opened a very good airport, which is one of the most elegant airports in the country. To thrive and develop, it needs a reliable anchor carrier and we are grateful to Aeroflot for their decision to create a hub in the Krasnoyarsk region. Currently, we are focusing on the need for a reliable transport system in the vast region that is Yeniseysk’s Siberia. With the creation of the hub, I see the chance to improve the accessibility of not only the surrounding area, but also other Russian regions and countries both near and far abroad,” adds Alexander Uss, governor of the Krasnoyarsk region. While the region is indeed big – with its land mass equal to nearly one quarter the size of the entire nation of Canada – its population is just some 2.8 million, or two per cent of the whole Russian Federation. 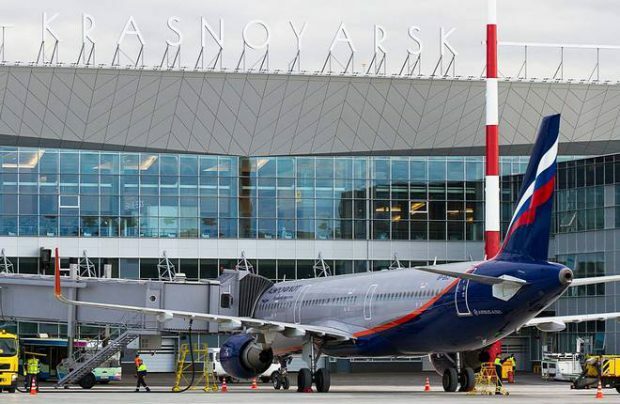 “The development in cooperation with the largest Russian air carrier of a new hub at Krasnoyarsk will be the start of a new chapter for Krasnoyarsk airport,” stresses Andrey Metzler, chief executive of Krasnoyarsk International Airport. In November 2018, Aeroflot’s board of directors approved a new ‘100 by 100’ development strategy, – in reference to its targeted handling of 100 million passengers by Airline’s 100th anniversary in 2023, that called for the creation of an international hub at Krasnoyarsk.